It's not always Royal Mail's fault - or ours - if we don't deliver on time! Most dealers and some collectors will know that dealers registered with Royal Mail can obtain their stamps (etc) in advance of the issue date. This enables us to prepare first day covers ahead of time and generally have them ready for sale with a variety of handstamps soon after the issue date. This facility extends to Prestige Stamp Books, and in this case we are supplied with unbound panes. That saves us taking them out of books (which is a time-consuming and sometimes damaging process), and of course saves them from being bound into books which presumably saves Royal Mail some money, saves some effort, and saves on waste (save the planet!). For the Classic Album Covers we received the first full booklets just before Christmas - not many working days before the issue date of 7 January. The loose panes were even more delayed and finally arrived on 6 January with a big surprise: they were not full size! In fact it is quite possible that they had been produced by guillotining bound books and extracting the stamp panes that we wanted! Whether this is true or not we may never find out. We can't fault the people at Royal Mail Tallents House: they got the stock in late, and they got it out as quickly as they could. As I acknowledged to them at the time, it wouldn't have ocurred to me to check them either! 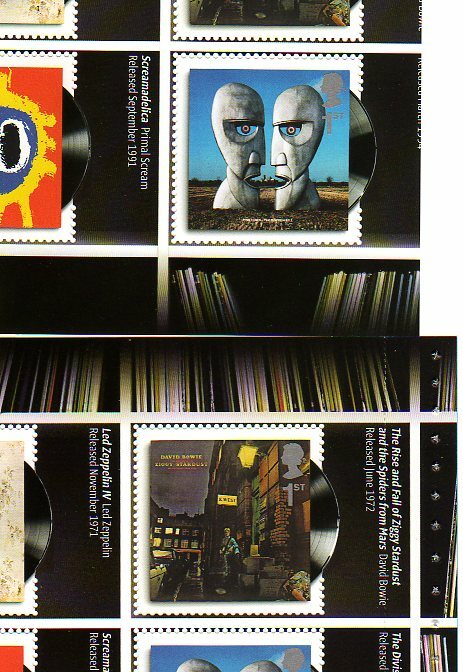 And of course whilst we might have been forgiving and found it just about acceptable with any other PSB, the Album Covers PSB was different because the two special pane stamps were bound face to face. This meant that the rouletting line (which is where these were guillotined) actually passes through the caption on the Ziggy Stardust and Division Bell stamps. The upper part of the picture shows the short pane, and the lower part shows an undamaged pane, taken from a book. Clearly the 6-stamp pane 2 as delivered would not be acceptable on first day covers as the caption is missing from the stamp surround. Of course this has had a knock-on effect on customer orders, not only those orders which include PSB fdcs. We have had to take time out from processing other orders to carefully fix the 100-odd panes to the FDCs and send them for postmarking, which we normally have done before the stamps were issued. So apologies to all our customers who have not yet had their orders, and to whom we cannot spare time to write individually. We're back working on them as fast as we can, whilst also updating the website and blog to keep everybody informed.